DS 7 CROSSBACK – PERFORMANCE Line PT225 EAT8. Company car drivers & fleet managers could be forgiven for being confused at the moment. The way that the UK measures car emissions has changed. Under conditions defined by EU law, the Worldwide Harmonised Light Vehicle Test Procedure (WLTP) laboratory test is used to measure fuel consumption and CO2 emissions from passenger cars, as well as their pollutant emissions. What this means in general, is that the old method of measuring CO2 & emissions, has altered & so too will the official figures published by the car manufacturers, in most case for the worst. Some brands, notably Toyota, have already updated their figures, meaning that customers can see if the new emissions that their current vehicle now has, puts them in a different company car tax bracket or not. However, because of the sheer complexity of testing every car, the earliest that drivers will expect to see a change to their tax bill, will be April 2020, although this date is more likely to be when we see the new figures used for tax purposes & published in adverts, rather than actually being implemented by the Inland Revenue. Following this, 2021 will see WLTP figures finally killing off their NEDC predecessors. Clear so far ? ? Hopefully, this does make some sense, because as a motoring writer in the fleet sector, the question of whether company car drivers should choose petrol, diesel, plug-in-hybrid or EV seems no easier to make, especially when Euro6 diesel engines are taken into consideration. Which brings us to the French brand DS. Having just launched as a stand alone franchise, DS, will like alll of the other manufacturers have been planning ahead, so that their latest new model the DS7 Crossback, will be available as a petrol, a diesel & from next year, a plug-in-hybrid. Company Car has already driven the diesel version, which we really liked, so the opportunity to try out the equivalent petrol version was too good to miss. 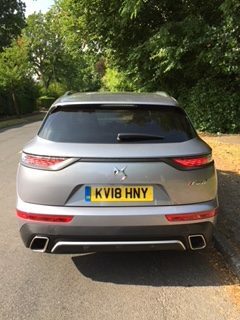 Trying to design a mid-size Crossover that looks different to it’s competitors, must be a thankless task, but the designers behind the DS7 have at least tried to think outside the box. Launched with four trim levels, Elegance, Performance Line, Prestige & Ultra Prestige, the Performance Line model we tested looked fantastic in Cumulus Grey & in this trim, will definitely appeal to business customers. These cars get 19″ ‘BEIJING’ diamond cut alloys, Art Black Basalt Nappa leather dashboard & door panels, a 12.3″ HD touchscreen, Inox Roof Rails, LED Front fogs with cornering function, Manual ‘Follow me home’ lighting, LED Daytime Running Lights, DS Active LED Vision, DS 3D LED rear lights, High beam assist & full LED interior lighting. Climb aboard & you’ll notice that DS have added some nice touches inside as well & most are not at all boring. Triangle shaped air vents at each end of the dashboard are noticeably different, as is the location of the starter button, smack bang in the top centre of the dash, flanked by the two central air vents. The landscape touchscreen is also a highlight & the angular electric window switches set in the centre binnacle also add to ” le difference ”. Even the graphics on the PSA Group’s 12.3″ digital instrument cluster in front of the driver, can be configured with rhombus shaped graphics, something I have not come across before. Elsewhere, the dashboard switches, door fittings, seats & steering wheel are satisfyingly all top notch, with only the lightweight plastic used on the glove box, letting things down a touch. Overall, the ambience within the cabin is just right & the drivers seat in this new DS is great place to be. DS have included some useful storage in the cabin. There is a flip cover space in front of the gear stick, good for keys & your mobile phone, with the USB socket also accessible here. The centre binnacle features a pop-up open & close arm rest with storage space within. There are two cupholders in front of this plus decent sized door pockets as well. Front passenger head & legroom is excellent & in the rear there’s a flat floor, which coupled to the generous space on offer, means that you could fit five adults in the DS7 if required. There’s also a rear armrest hidden in the centre rear seat, which also features two cup holders. 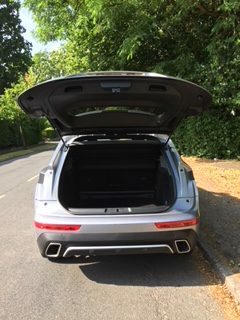 With all five seats in place, 555 litres of boot space is on offer & when you fold the rear seats down this goes up to a quite considerable & class leading 1752 litres, plenty of space. We tested the on board tech & are pleased to report that connection your mobile phone to the car’s Bluetooth Hands-Free telephone is straightforward, as is linking to Apple-Car-Play. The built in SatNav works well. 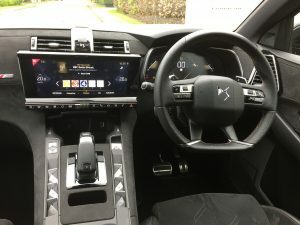 Like many other models, the DS7 features climate controls located in the touchscreen. Whilst you can adjust the temperature without having to leave the radio or SatNav screen, to adjust the fan speed you do need to enter the climate screen which means selecting the climate toggle underneath the screen, then touching the screen which whilst on the move. This sounds complicated & at first it is, but after a few days inside the DS7 it becomes simpler, I promise. The 1598cc petrol engine we were testing this time, comes with 300Nm’s of torque compared to the diesel’s 400Nm’s, but it’s quicker than the diesel, hitting 62 mph from a standing start in just 8.3 seconds, with a top speed of 141mph. It’s also quieter than the diesel, both around town & on the motorway. The steering is light & precise & as a motorway cruiser it’s very impressive. The DS’s suspension makes for a comfortable ride & there is little or no body roll, even around sharp bends. We mainly utilised the Eco driving mode, which increases fuel economy, whilst making the steering a touch lighter, noticeably more than when you select Sport mode, whilst Comfort mode makes for a more forgiving ride. The interior designers who worked on the DS7 have definitely created its unique identity. However, something you can’t play around with is interior space & this is where the DS7 really shines, leaving many of it’s competitors trailing. It’s more spacious than the Volvo XC40 for example, with a larger more useful boot. 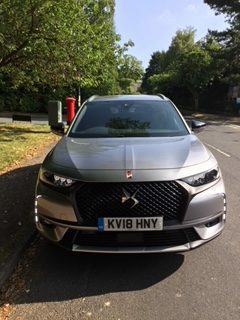 My teenage son is six feet tall & commented that there DS7 offered him loads of lounging room, room he didn’t get in the Volvo, the BMW X1, the teeny-tiny Q3 or the Range Rover Evoque. The question of a petrol or diesel DS7 needs to be addressed. Whilst the petrol we tested offers a claimed combined fuel economy of 48.7mpg & emissions of 137g/km, the diesel we drove earlier this year features emissions of 128g/km with a combined fuel economy of 57.6mpg. Go for the less powerful diesel BlueHDi 130 manual & the figures improve considerably, with emissions falling to 121g/km & the combined economy increasing to 72.4 mpg. This entry level model is offered with a P11D value of £27,875 & a BIK of 22%, whilst our petrol test car’s P11D was £39,730, with a BIK rate of 26%. 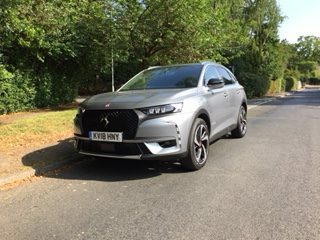 It back up the diesel victory above, our week in the 180 diesel DS7 we averaged just over 43mpg, whilst a week in the petrol 225 DS7, we returned an average of just 35mpg. What this illustrates, is that diesel still out performs petrol on economy & emissions, although it is diesel particulates that has the UK government running scared. I’m guessing that the plug-in-hybrid DS7, due in 2019, will offer an electric ranger of 30 miles, so if you aren’t changing your company car immediately, then this could be worth waiting for. In conclusion, the petrol DS7 is the equal of the diesel version, except that it’s better to drive, quicker, more agile & quieter. on the negative side, it’s more expensive to buy & to run. This is a conclusion that won’t really help you make your mind up about which fuel to choose. 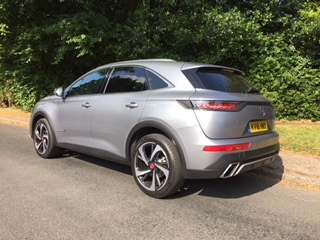 What I can categorically state though, is that the DS7 Crossback is a personal favourite amongst the cars that I’ve driven this year, petrol or diesel.